Brazos Valley residents who recycle like to know that they’re doing their part to help their community and their environment be a little bit cleaner. 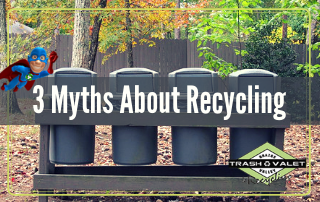 You may be fairly sure you can trust your recycling to end up in the right place, while skeptical neighbors wonder if it’s simply dumped in a landfill with the rest. It can be hard to feel in control of the process after placing your recycling in the bin and hoping it ends up in the right place. That’s why it’s a good idea to do research and be informed about the rest of the process. One element that gives rise to skepticism and concern when it comes to recycling is actually one of the most convenient advances in the recycling world. At one time, residents had to sort their recycling themselves: plastics in one bin, paper in a second bin, glass in a third bin. This could be tedious and even warded some away from recycling. Now, however, there’s single stream recycling, which allows all recycling to be collected in one bin. However, this doesn’t mean that your recycling isn’t sorted at all. Rather, the equipment at the recycling center — through the use of magnets and lasers — sorts your recycling there so you don’t have to worry about it. But what happens after your recycling is sorted? Once the recycling is sorted, the next step is to clean it and strip it down to raw materials. 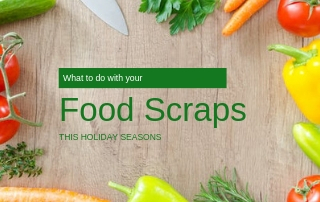 This is why it’s important to make sure your recycling doesn’t have food grease or lingering chemicals before you send it off. 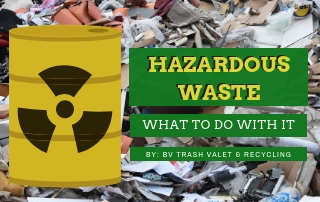 These contaminants can make it it impossible to return the material to the way it was, and can even impact the other recyclable materials it touches. In these cases, the recyclables will need to be thrown out. Once the recyclables are cleaned and baled they’re sent to a plant where they’re converted back to raw material, ready to be used again, good as new. The trend of recycling extends beyond simply sorting your recycling into a separate bin. Consumers also increasingly prefer products made from recycled materials to new materials. It saves resources when products don’t have to be made from all new materials. And corporations, of course, want to give their customers what they want. So in the final step, corporations will buy the recycled materials from the recycling plant and use them to create new products, products on which they can place a label that says “ecofriendly” or “made 100% from recycled materials.” Those products hit stores again and consumers buy them. In a funny twist of fate, your old recyclables may even end up in your home again in a way you didn’t expect. 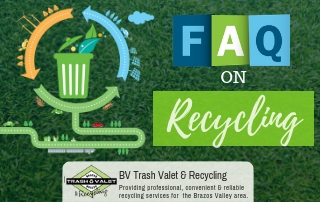 Recyclers want to be informed about just how much of an impact they’re making, and we at Brazos Valley Trash Valet & Recycling understand that. If you have any questions about what happens to your recycling when it leaves your home, contact us today.